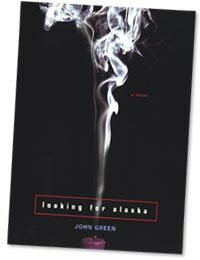 Looking for Alaska by John Green is the story of Miles Halters’ (aka Pudge’s) search for a Great Perhaps. He leaves home for boarding school, convinced this is the only way he’ll ever find one. Once at boarding school, he begins a great journey of love, loss, and the eventuality of death. Looking for Alaskahas been raved about by many a reviewer, including the notoriously snarky Steph of Reviewer X. Oddly enough, this made me wary of the book. It can’t be that good can it? I was prepared for disappointment (like Pudge in the first chapter). Boy, am I glad I was wrong. First of all, it had nothing to do with Alaska the state, which I was immensely grateful for due to the fact that I have read wintery, Eskimo stories, and to be frank, I disliked them. I hated them. I despised them. But Looking for Alaska was amazing. It’s one of those books you just can’t review without being fan-girly. It had a wonderful plot, it kept you guessing (100 -something days til what?) and it dealt with characters and emotion very well. If you are one of those people that dislikes a well-written book with an amazing plot and even better characters, I would not recommend this book. But everyone else- go get it. Now. You will devour it. Thirteen Reasons Why was one of those books that you cannot put down. I started it eighth period Monday and finished it at about 8:30 that night.Jay Asher’s characters are very real, and the emotions are expressed very well. The only qualm I had with this book was that Clay’s reactions to Hannah’s stories sometimes got in the way. Other than that, it was an amazing read that I would definitely recommend to teens. Keeping Faith by Jodi Picoult is about Mariah White and her daughter, Faith. After walking in on her husband with another woman, Mariah’s life is turned upside down, as is Faith’s. But while Mariah slowly learns to come to terms with her divorce by herself, Faith has a little support, an imaginary friend she calls God. As you can imagine, when a 7-year-old starts talking to God, it’s a little odd. But what about when she starts bleeding from her hands? What do you do, as a mother, then? What about when her father asks for custody? You can find out all this in the book-but not whether Faith is really talking to God. That, you have to decide for yourself. And the fact that you do is one of many reasons why Picoult is such a great author. Keeping Faith by Jodi Picoult was wonderful. It’s very controversial, like all her books. Is there a God? Is s/he really talking to a non-practicing Jewish 7-year-old? You decide. But before you do, read the book. It will definitely be worth your time.